CRUSHCURATORIAL is pleased to host Science Fictions, a two-person exhibition of works by Brittany Nelson and Gabriela Vainsencher. This show is presented in collaboration with independent curator and critic, Nicole Kaack. 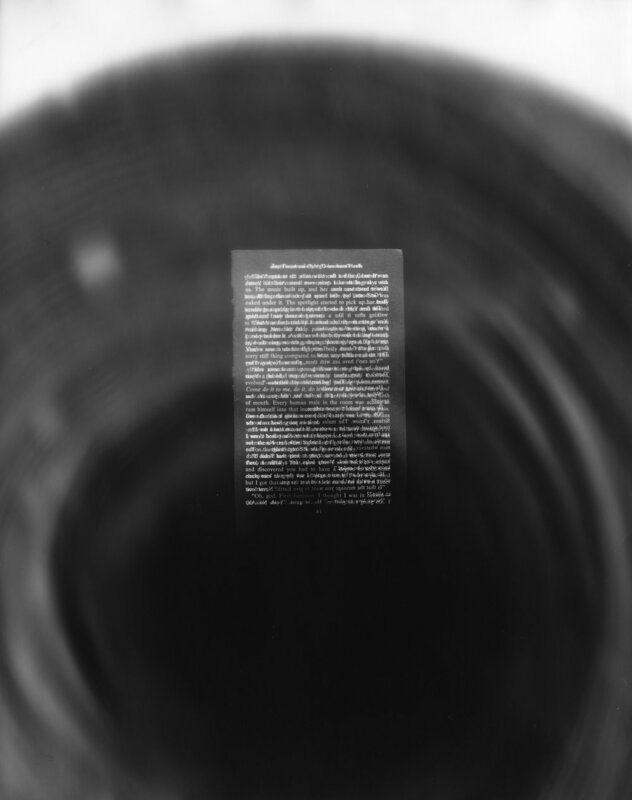 Approaching the present from opposing tenses, Vainsencher and Nelson cast archeological discovery and space exploration as fictions of a future and past. 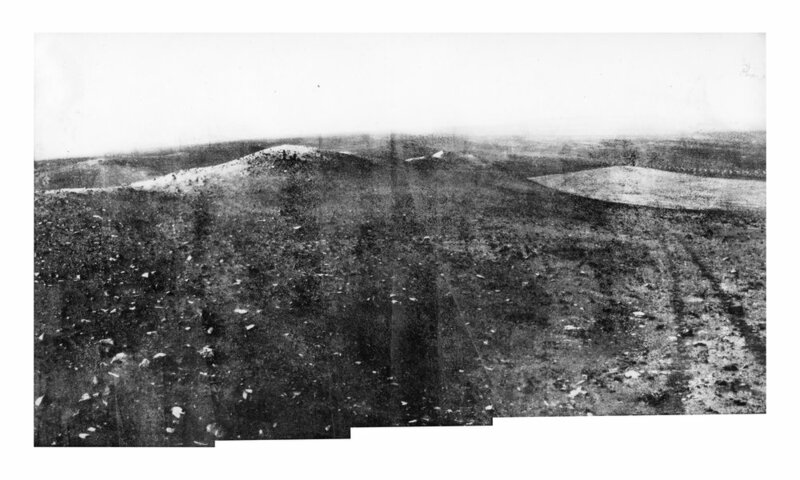 The composite forms of Nelson’s gelatin silver prints and Vainsencher’s photo-collages offer terrain for postulation and exploration in the full-bodied invention of a vase’s plump form and the desolate horizons of a Martian vista; both artists begin to riff, elaborating on an assumed circumstance, another time hoped for or re-created in present. 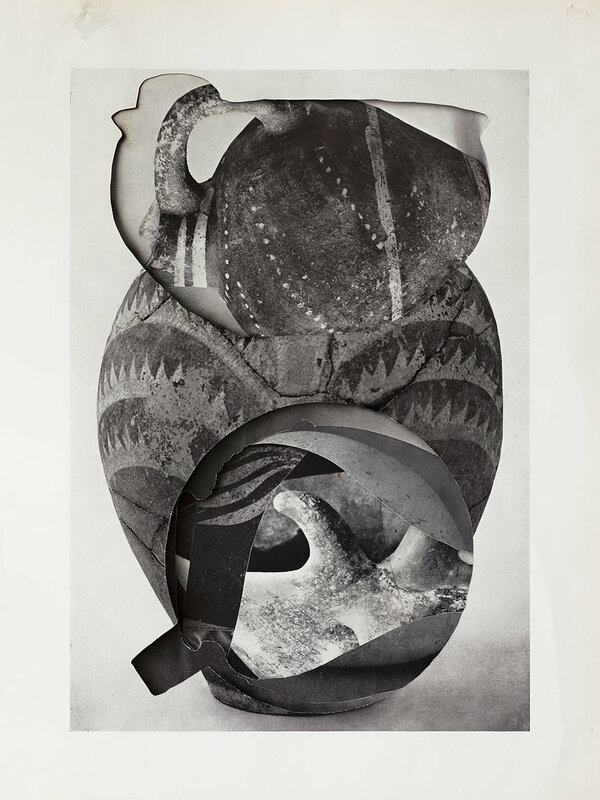 Vainsencher’s ceramic sculptures refer in outline to the flattened forms of her photo-collages, while also citing the origins of these works in Pre-Minoan artifacts extracted from Mediterranean soil. 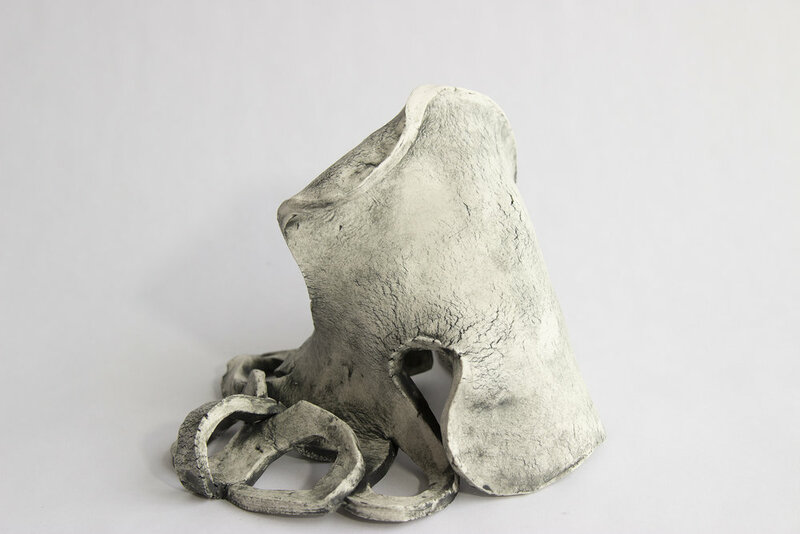 Finding analogy to this corrosive timescale in falling figures sketched from wet clay, Vainsencher uses material limitations as means of creation, suspending her sculptures at precarious points in the warp of decay and deterioration. Prompting the question of survival, Vainsencher’s sculptures play on the possibilities of a past encountered only in acted traces. By contrast, Nelson’s prints look into the hoped-for future, sweeping gallery walls in the furtive movements of a handheld flashlight. The forms themselves, disrupting traditional photo-processing methods, mirror the process-oriented gestures of Vainsencher’s swooning clay-bodies, capturing in stillness a form that would otherwise continue to evolve. Unraveling through the pages of a science fiction short story written by Alice B. Sheldon (alias James Tiptree,Jr. ), Nelson’s photos re-write this narrative through the valences of encounter and identity. Confronting each other obliquely through the shared space of the exhibition, Vainsencher and Nelson suggest parallels between unrealized possibilities and histories beyond memory, telling the story of the present through the eventuality of past and future time. Thursday, June 28th from 6:00 p.m. to 8:00 p.m., Opening reception. The opening event will also launch a limited-release poster featuring images by Vainsencher and Nelson, as well as writing by curator Nicole Kaack. Friday, June 29th at 7:00 p.m. Brittany Nelson and Gabriela Vainsencher will discuss fiction, futures, and re-writing the past. The conversation will be moderated by the curator, Nicole Kaack. Monday, July 2nd at 7:00 p.m., Ariel Goldberg will read an excerpt from their upcoming novel in response to the life and artistic practice of Berenice Abbott and her partner Elizabeth McCausland. (b. 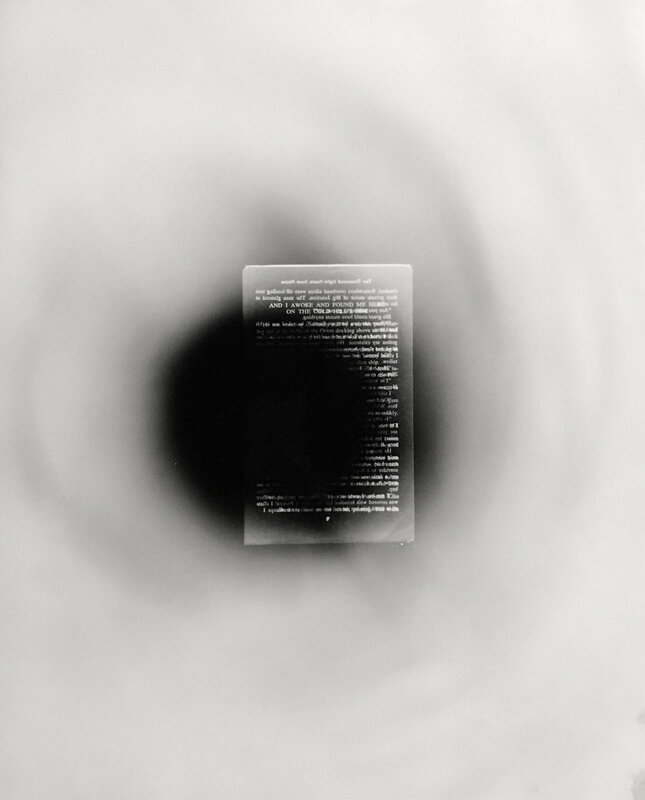 1984) works with 19th century photographic chemistry techniques to address themes of feminist science fiction and queer abstraction. She received her MFA in photography from the Cranbrook Academy of Art, and her Bachelor of Arts from Montana State University. She is the recipient of a 2015 Creative Capital Grant in Visual Arts and a Theo Westenberger Foundation Grant for advancing women in the arts. Select solo exhibitions include PATRON Gallery (Chicago, IL), Morgan Lehman Gallery (New York, NY), David Klein Gallery (Detroit, MI), Sadie Halie Projects (Minneapolis, MN). Group exhibitions include Brooklyn Academy of Music (Brooklyn, NY), The Newcomb Art Museum (New Orleans, LA), The Cranbrook Art Museum (Bloomfield Hills, MI), and the Houston Center for Photography (Houston, TX). 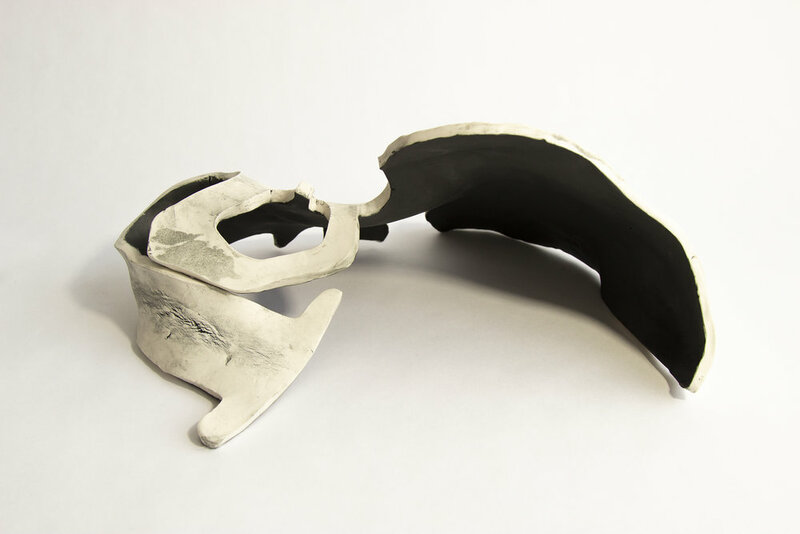 Nelson was a 2017 artist in residence at the Headlands Center for the Arts and her work has been featured in publications such as The New Yorker, WIRED, Collector Daily, Aesthetica, and New Art Examiner. born in Buenos Aires, raised in Tel Aviv, and currently lives in Brooklyn. She received her MFA from Hunter College in 2016. Past solo and two-person exhibitions include Hanina Gallery, Tel Aviv, Israel; Musée d’Art Moderne André Malraux, Le Havre, France; Parker’s Box Gallery, Brooklyn, NY; NurtureArt, NY; and La Chambre Blanche, Québec City, Canada. Her work has been included in group exhibitions including Bergamo Modern and Contemporary Art, Italy; Kunstforening, Tromsø, Norway; Pierogi gallery, Brooklyn, NY, The Freies Museum, Berlin and The National Gallery of Saskatchewan, Canada. Residencies include Yaddo, The Atlantic Center for the Arts (USA), Triangle Arts Association (France), and La Chambre Blanche (Canada). Concurrently with this exhibition, Vainsencher’s work can also be seen at Spencer Brownstone Gallery, NY, NY. In 2019 A.I.R. Gallery in Brooklyn, NY will present a solo exhibition of her work. Vainsencher is the founder of the Morning Drawing Residency, writes about art for Hyperallergic, Title Magazine and Tohu magazine. She also teaches art at Williams College, in Williamstown, MA and at the Macaulay Honors College at Hunter College, NY.